Originally, Imola was an ancient Roman colony called Forum Cornelii, built on an area that was already populated in the prehistoric age. 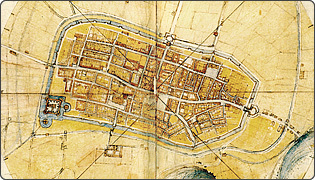 The city plan still retains the typical pattern of a Roman town with the intersection of the decumanus (via Emilia) and the cardus (via Appia - via Mazzini) where the ancient forum once rose. Between 1300 and 1400 Imola was ruled by three different powerful families: the Alidosi, the Manfredi and the Visconti. In 1473 the town went under the rule of Caterina Sforza, young bride of Girolamo Riario: what followed was the flourishing of the Renaissance period. From 1504 until the Unification of Italy (1861), excluding the brief Napoleonic era, Imola was part of the Papal State: the considerable embellishment works of the 18th century gave a new look to the town. In the following years, Imola developed with success the cooperative system that became one of the leading features of the social and economical aspect of the town. During the Second World War, Imola - which was severely damaged especially in the years 1944-1945 because of the proximity to the front - actively took part in the struggle for liberation and was subsequently awarded the gold medal for military valour. During the 1950's, the town began to expand rapidly through the building of large new suburbs and industrial estates and gradually its economy shifted from a predominantly agricultural vocation to the today's industrial and service sectors. Late night openings on Sundays and holidays during major events in the city.